Three of the big four London-listed miners have released earnings this month, and it’s clear the companies are doing what shareholders have demanded of them. Glencore Plc, which traditionally favored stuffing its war chest over rewarding shareholders, surprised the market with a $2.9 billion payout Wednesday. 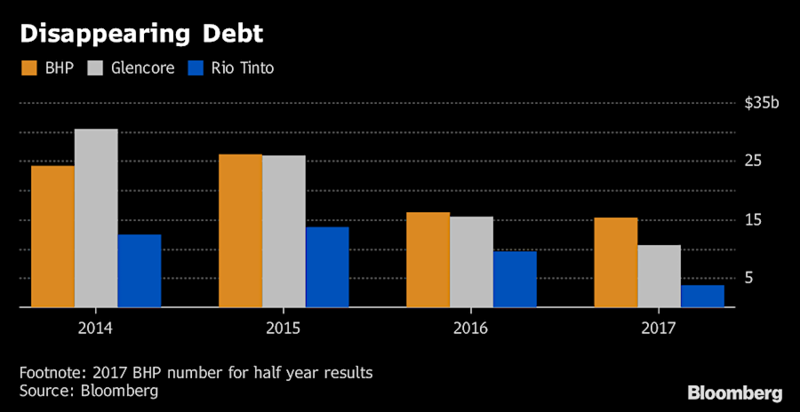 Rio Tinto Group promised $5.2 billion in dividends with an additional $1 billion stock buyback, and BHP Billiton Ltd., whose financial year ends in June, also made a generous interim payment. With metals from zinc to copper trading near multiyear highs, the four producers (Anglo American Plc reports Thursday) generated combined free cash flow last year of about $87 million a day. A few years ago, they might have been tempted to blow that money on deals, but with the dark days of 2015 still fresh in investors’ minds, they’re focusing instead on dividends. All that cash has also helped them drastically cut debt. Glencore Wednesday said it had lowered borrowing by almost $5 billion in the last year and by almost two-thirds since 2014. And expect the trend to continue. Anglo is raking in cash from assets such as coal and iron ore mines that it only recently wanted to ditch. Analysts expect it will use that money to reinstate its full-year dividend, which it suspended in 2015, and continue to pay down debt.